Last summer KCLoftCentral opened a distinctively new apartment building in Downtown Kansas City called ‘The New Yorker’. This Wes Anderson-esque nine story apartment building, commonly know as ‘Kansas City’s Skinniest Skyscraper’, was originally constructed in 1915 as the Hotel Bray. During 2017-2018 KCLoftCentral renovated the building into some of Downtown KC’s most affordable market rate apartments and the Made in KC Cafe. Due to the high demand for these chic apartments and the hard work of KCLoftCentral’s amazing leasing staff The New Yorker was 100% pre-leased at Grand Opening in 2018. Don’t miss your chance this time around to love NY in KC at The New Yorker. Starting in May 2019 KCLoftCentral will have limited availability at this property. All apartments at The New Yorker feature restored concrete and tile flooring, modern kitchens and baths, NEST thermostats and Google Fiber. Building Amenities include free laundry, fitness studio, social lounge, storage and parking available for rent in the garage next door. These apartments will be available for May move ins call us today to schedule a tour 816-842-6544: New Yorker #404 (Verrazano) – $895/month; airy 1 bedroom 1 bathroom apartment with windows on the south and west side of the building. New Yorker #602 (Manhattan) – $960/month; spacious 1 bedroom 1 bathroom apartment with large living room and private bedroom. 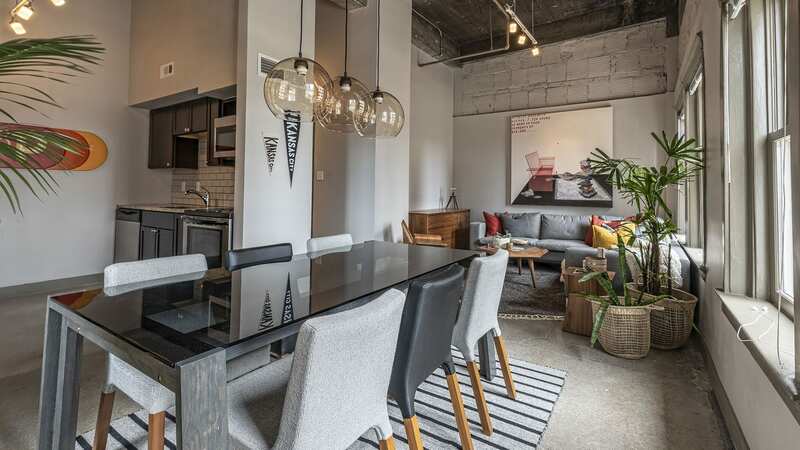 New Yorker #201 (Brooklyn) – $1,315/month; this is the largest apartment in the building with a great kitchen for entertaining and a secret pantry. Tags: Love NY in KC!